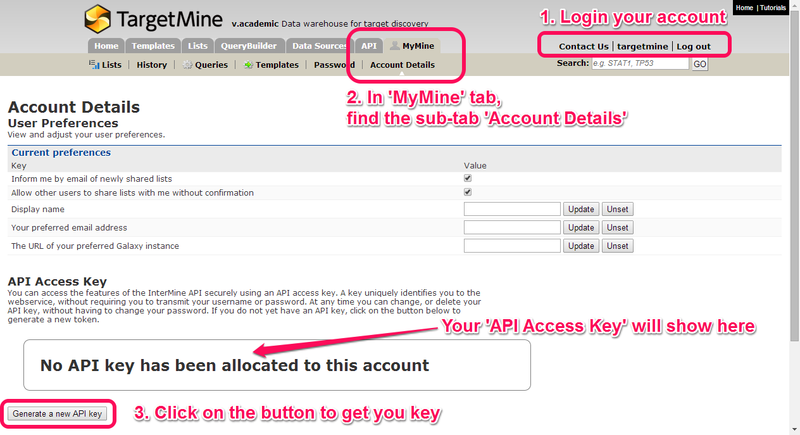 You can access TargetMine securely using an API access key. A key uniquely identifies you to the webservice, without requiring you to transmit your username or password. At any time you can change, or delete your API key, without having to change your password. Where to get my “API Access Key”? You can get your API Access Key by the following steps. In “MyMine” tab, find the sub-tab “Account Details”. At the lower part, you can find “API Access Key” section. Click on the button to generate your own key. Login and in the ‘MyMine’ tabe, find the sub-tab ‘Account Details’. Click on the ‘Generate a new API key’ button to get the API key.